The Connecticut State Department of Education and the Connecticut School Paraprofessional Advisory Council established the Anne Marie Murphy Paraeducator of the Year Program to recognize the important role of the paraeducator in supporting student achievement. The award is named in honor of Anne Marie Murphy, a paraeducator who was killed at the Sandy Hook School in December 2012. The program honors one paraeducator in each school district who has demonstrated exceptional skill and dedication in the performance of his or her job and confirms the important role of the paraprofessional in supporting the achievement of our students. We are excited that in the last three years this recognition has brought out many recommendations from all four schools for our outstanding group of paraeducators, some who work with students with special needs and others who perform multiple roles throughout the day. 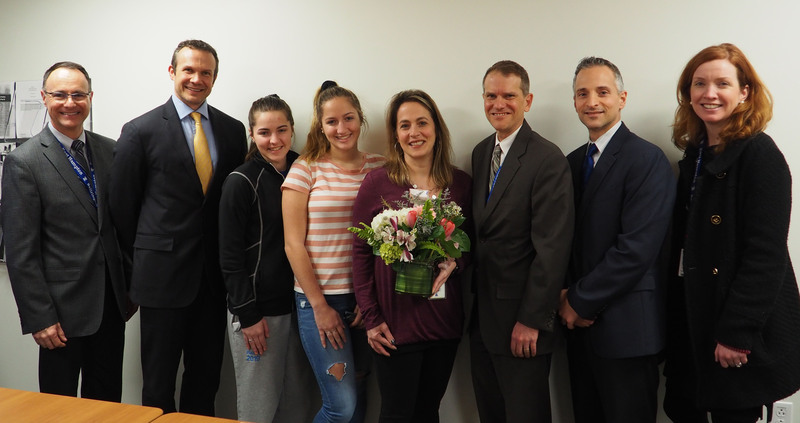 Melissa was nominated by her colleagues at the High School who describe her as an “essential” paraeducator for student success and a person who makes a difference every day to the community of East Hampton High School. Her nomination highlights how she works tirelessly to ensure that the students with whom she works at the High School strive for and achieve academic success. Her encouraging, intelligent, and warm style allows students to work easily with her and openly ask questions about material from their courses. Her support and high expectations for her students help them to study effectively and do well in their academic classes. If students are struggling with an assignment and haven’t turned it in, they know Melissa will call them in for help during X-Block and they also know that she will be there by their side until they finish their work. Melissa is committed to her craft. But more important is her commitment to the school. Besides a proud employee, she is a proud mom and proud resident of East Hampton. She is a true professional who has recently returned to school to attain a Masters of Education with a certification in Special Education. Congratulations to this year’s Paraeducator of the Year, Melissa Balda.